Hidalgo County (Spanish: Condado de Hidalgo) is the southernmost county of the U.S. state of New Mexico. As of the 2010 census, the population was 4,894. 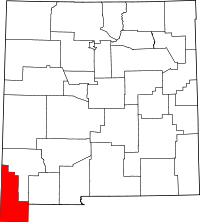 The county seat and largest city is Lordsburg. A bill creating Hidalgo from the southern part of Grant County was passed on February 25, 1919, taking effect at the beginning of 1920. The county was named for the town north of Mexico City where the Treaty of Guadalupe Hidalgo was signed, which in turn was named for Miguel Hidalgo y Costilla, the priest who is known as the "Father of Mexican Independence". This county abuts the Mexican border. According to the U.S. Census Bureau, the county has a total area of 3,446 square miles (8,930 km2), of which 3,437 square miles (8,900 km2) is land and 9.1 square miles (24 km2) (0.3%) is water. The southern part of the county, the part bounded on the east and south by Mexico, is known as the Boot Heel. As of the 2000 census, there are 5,932 people in the county, organized into 2,152 households, and 1,542 families. The population density is 1 person per square mile (1/km²). There are 2,848 housing units at an average density of 1 per square mile (0/km²). The racial makeup of the county is 42% White and about 55% of the population is Hispanic. Size of family households: 592 2-persons, 341 3-persons, 316 4-persons, 165 5-persons, 83 6-persons, 48 7-or-more-persons. The average household size is 2.7 and the average family size is 3.29. In non-family households, there are 684 with 314 male householders (286 living alone), 293 female householders (262 living alone), and 77 non-relatives. In group quarters, there are 85 (all institutionalized). In the county, the population is spread out with 31.70% under the age of 18, 7.80% from 18 to 24, 25.20% from 25 to 44, 21.70% from 45 to 64, and 13.60% who are 65 years of age or older. The median age is 35 years. For every 100 females there are 99.60 males. For every 100 females age 18 and over, there are 97.00 males. The median income for a household in the county is $31,286. The per capita income for the county is $12,431. 27.8% of the population is below the poverty line. Out of the total population, 38.90% of those under the age of 18 and 17.00% of those 65 and older are living below the poverty line. Unemployment rates in April 2010 was 7.6%. Of the 1,936 households, 33.4% had children under the age of 18 living with them, 46.4% were married couples living together, 14.2% had a female householder with no husband present, 33.6% were non-families, and 29.1% of all households were made up of individuals. The average household size was 2.49 and the average family size was 3.09. The median age was 40.9 years. The median income for a household in the county was $36,733 and the median income for a family was $41,594. Males had a median income of $43,531 versus $23,482 for females. The per capita income for the county was $17,451. About 20.6% of families and 22.6% of the population were below the poverty line, including 32.3% of those under age 18 and 15.0% of those age 65 or over. Hidalgo has historically been a swing county, going for the winner every time since 1928, except for once, when it went for Hubert Humphrey over the eventual winner, Richard Nixon. ^ a b "State & County QuickFacts". United States Census Bureau. Archived from the original on July 11, 2011. Retrieved September 29, 2013. ^ "County History". Hidalgo County, NM. Retrieved January 2, 2015. ^ "New Mexico: Consolidated Chronology of State and County Boundaries". New Mexico Atlas of Historical County Boundaries. The Newberry Library. 2007. Retrieved January 1, 2015.